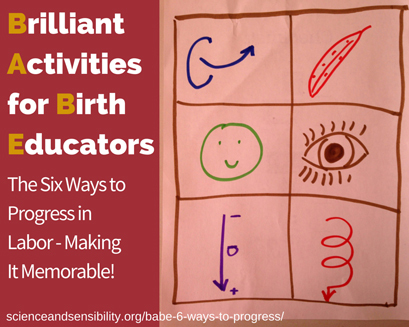 Series: Brilliant Activities for Birth Educators - The Six Ways to Progress in Labor - Making It Memorable! Time for another post in the "Brilliant Activities for Birth Educators" series. The purpose of this monthly series is to share engaging, interactive and effective teaching ideas that childbirth educators can use in their classes. We know that when families are participatory, engaged and interacting with their partners, other class members and the instructor, real learning (and retention) happens! Today, I share an idea I modified from an activity that I originally saw Michele Deck, former Lamaze International President and exceptional trainer, share at a the REACHE conference in Tacoma, WA several years ago. In my childbirth classes, I like to have parents understand that there are many ways that their bodies are preparing for birth. Changes happen in the weeks, days and hours leading up to the moment of birth. I feel that if parents understand the six ways to progress in labor, they can appreciate that at times, cervical dilation (the most "well-known" of the six ways to progress) may not be changing, but other changes may continue to show that their body and baby are working towards the big moment of birth. Parents leave class understanding that labor progress is a coordinated effort by the parent's body and the baby that incorporates many different changes. At the end of the activity, class members will be able to describe the six ways that labor progress can be measured and explain why the focus should not just be on dilation, but rather on the synchronized way that change is happening throughout the pre-labor and labor period. My hope is families will recall this information during labor, if the cervix is measured and the cervix has not dilated significantly since the last exam. The supplies for this activity are very simple. I tape a large piece of newsprint at the front of the room, which has a rectangle drawn on it, divided up into a "table" of 2 squares x 3 squares with a colorful marker. I give each class participant a similar table, on a regular 8 1/2 x 11 sheet of paper, and make sure they have a pen. I have several different color markers for them to use in front of the class. I also use the standard childbirth class teaching tools - the fetal model, a knitted uterus, and a pelvis. I cover the six ways to progress after we have discussed the events of late pregnancy and before the stages of labor. When I start the activity, I share that we will be discussing the six ways to progress in labor and that many people, parents and health care providers alike, focus on dilation, but there are many ways to assess progress and it is important to understand all of them. After I cover the first way to measure progress, the cervix moving from posterior to anterior (which you can teach using your favorite technique), I ask them to draw a simple symbol ("like a kindergarten student might draw, quick, simple and without words") in the first square. The symbol that they draw will help them to remember what happens first. After they have drawn their first symbol on their own paper, I ask for a volunteer to come up and draw it on the class sheet up front. Everyone "oohs and aahs" at the class drawing and then all share what they drew. We move on to the cervix ripening. Again, I teach this in my typical way and ask them to draw another drawing on their own paper to represent ripening in the second square. Another volunteer comes up to draw for the class and we all share what everyone drew. I repeat this process for all six ways to progress. So that they can really solidify and remember each of the six ways to progress, after we discuss and draw a new square, I go back, and while pointing at the specific square, ask - "what happens first? and second? and next...?" The class repeats back what is happening. After all six ways are completed, I ask them to turn their papers over, and ask randomly - "what happens fourth?" "and sixth?" "first?" without looking at anything but pointing on the wall, where the squares were located before I took it down. Every single class member is able to a) identify what happens in each step and b) what that means for the labor, even after I have removed the newsprint. I let them know that I will randomly ask them this information sometime later on in the series and the person who can answer all six correctly, gets a prize. A week or so later, in class, I ask for someone to recall the six ways to progress and award a prize to the first person who correctly names them all again! Class members enthusiastically compete with each other to be the first to recall all six ways to progress. 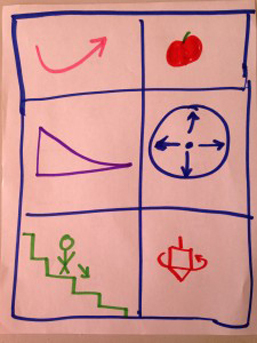 This method of using the squares, both at their seats and in the front of the class, really helps the families to remember the six ways to progress in labor. There is lots of laughter and admiration for everyone's clever ideas on how to represent each method, they really remember what the symbols stand for (and the actual action that happens in labor) and they are still remembering it several weeks later. This activity is always a lot of fun to do in my childbirth classes and appreciated and enjoyed by the participants. How you can modify this activity? This activity reinforces retention and can be modified for many purposes in your childbirth classes. You could do a similar activity for talking about safe sleep, how to tell if baby has a good latch during breastfeeding, or even apply it to Lamaze International's Six Healthy Birth Practices. By using the idea of drawing a simple symbol to represent a fact, and being asked to recall it several times, people really find that the information worms its way into their memories, and they can recall it later when it is needed. After all, several weeks or months can pass from childbirth class to the big event, and anything we can do as childbirth educators to help families retain information for their recall when they need it down the road is a big win! 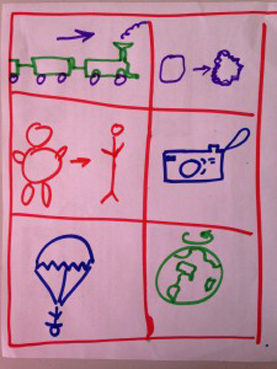 I invite you to draw your ideas for the six ways to progress in labor, or conduct the same process for another childbirth class topic and share it with all of us. What topic ideas do you in mind to try with this method? Send me a picture of what you or your families have drawn, along with your contact information and website, and I can put them all up in another post. We can even try to guess the topic being discussed from the drawings - and you can see how effective this technique is. I am excited to see what you all come up with. Send them to me using this email address. Note/Disclaimer: The use of the acronym "BABE" (Brilliant Activities for Birth Educators) is not affiliated with, aligned with or associated with any particular childbirth program or organization.